Yes - with the Screen Resolution Breakdown Searchie. The Screen Resolution Breakdown Searchie will appear under your search results and will correspond to your current search query. 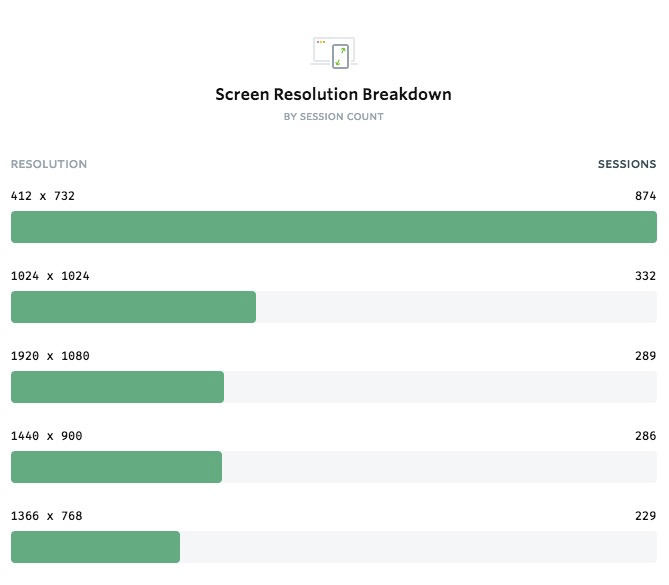 Not only will it show you the most common screen resolution for your users, it will show you the total counts for the number of sessions – who match your segment and your specified time frame – who accessed your site with a particular screen resolution. Note that this shows screen resolution and not viewport. Screen Resolution is the resolution in CSS pixels of the users screen. Viewport, is the size of the user's browser window at the time of the session. While we do not have a Searchie for viewport, you can search for them using OmniSearch. What do incredibly small Screen Resolutions mean? Sometimes, you may notice sessions with a screen resolution of 0x0 (because resolutions are rounded to the nearest 10, this includes 1x1). This is obviously a screen resolution that cannot exist, so it can typically mean one of two things. One, the session could have been recorded from a bot. Two, the user's browser did not properly record the resolution values so we are displaying it as 0.